Like most two years olds, my daughter loves Elmo. Something about his high-pitched voice and ever-present smile I guess. Parents innately learn to tune him out, probably to moderate the risk of going insane listening to that same shrill voice on reruns day after day. One episode that sticks out in my mind, today more than ever perhaps, puts Elmo in a room with none other than David Beckham. The short ends after Elmo, who pesters Becks to teach him to dribble a soccer ball on his head, learns a new word... Persistence. Persistence is an extremely important quality, and some might say a disappearing quality these days. It goes hand-in-hand with patience I think, something we can all agree is becoming scarce in this age of on-demand everything. Persistence, as in the case of Elmo and Becks, often pays off. Over the past few weeks, I've been involved in an exchange over the accuracy of Starry Night's eclipse predictions. One of our "power users" (who shall remain nameless for now) reported what he believed to be an issue with our calculations. They just didn't match up exactly with what NASA (and other government sites) were reporting. The discrepancy was small; in fact, the timings were exact, to the sub-second but the sizes of the Earth's shadows (both the umbra and penumbra) were too small by a very small but noticeable fraction. Normally no-one would even notice this, but in this case it changed our prediction for the April 4th, 2015 eclipse from a Total (as reported by NASA) to a Partial eclipse. That made all the difference to a few people. Were we perhaps using an old or imprecise value for the Earth's diameter? Nope. That was in agreement with the USGS. Were we taking the oblateness of the Earth into account? Yup. A precise calculation there too. Was this somehow rounding or another error in calculation? Nope. Everything seems to check out. After a few hours of this, I checked with my confrere, Bill (our SkySafari developer) to see if they had the same discord with NASA predictions. They did! And even better (worse, it turns out) both Starry Night, and SkySafari, two completely independently created applications, gave almost exactly the same result! That sealed it for me. Other matters were more pressing. NASA could be wrong too (note that it's not insane to believe this, the pages we were referring to were intended for the public, maintained by a summer student and weren't necessarily vetted by anyone), or could have used slightly different values for the radius of the Earth. Were THEY accounting for the oblateness? Doubts and lack of information made it difficult. After presenting my findings to Keiron, our head of support, I let the issue go. Lots of other stuff to work on. Again, the power user, and Keiron came back to me. Why were our predictions different? We claim arcsecond precision in our planet and moon positions. How could we make that claim if this discrepancy existed? Again, I chatted with Bill. He said he had been talking with Keiron too. I Don't know what this annoying user thinks he knows that we don't. What could it be? "The Earth's atmosphere?" Says Bill. I dunno. Does NASA take it into account? It's not clear from their site. How can we compare if they don't say? The discrepancy is so small. Again, an email from Keiron. "Aren't you busy?" I think to myself. I open it, a curt reply, ready at my fingertips. This time, the message comes with a link. Not just a clear explanation of what, how, and by how much the Earth's atmosphere contributes to the shadow, but authored by Fred Espenak himself, The Godfather of eclipse predictions! ... with a link to a clear explanation of what the Danjon shadow rule is, and its value. It turns out that the Earth's atmosphere contributes around 1/85 (just over 1%) to the diameter of the Earth's shadow... an effect that we were NOT taking into account in Starry Night or SkySafari... but are now! (SN version 7.1.2+, SkySafari ). Starry Night has been around for almost 20 years in some form or another, and we have never taken this into account, until now. We could all learn a little from this power user and Keiron (and Elmo for that matter). It pays to be persistent! Thanks for keeping at it guys. Starry Night is that much better for it. In recent years, NASA has conducted numerous exploratory missions that provided detailed measurements of the visual appearance and physical characteristics of most of the planets and moons in our solar system. These categories include IR/UV/visible imagery, physical, chemical and geological properties of the celestial bodies. Measurements range from surface features to physical properties to chemical and geological characteristics. Surface features consist of topography, albedo, roughness and age. Fundamental physical properties include gravity, magnetism and temperature. Chemical and geological quantities comprise elemental composition, mineral distributions, geological maps and crustal thickness. 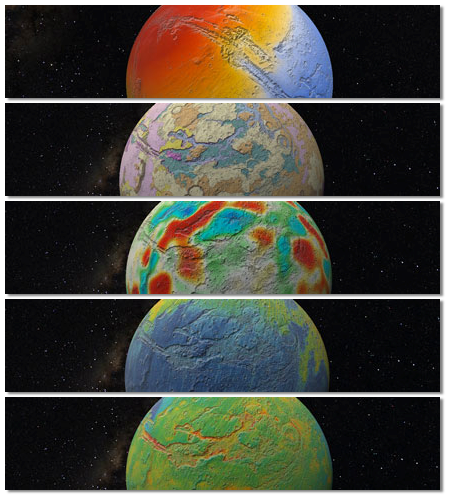 Starry Night Pro Plus 7 offers a Planetary Science Texture Compilation with over 100 additional maps. Planetary images and data were derived from the latest datasets available. The original, highest quality sources were used to produce maps with maximum fidelity. Gaps and artifacts in individual datasets were corrected with data from older or alternate sources obtained by other exploratory space missions to produce consistent, high quality images that clearly illustrate the parameters of interest. One of the many exciting new features in Starry Night 7, is the ability to accurately render stars as 3-dimensional bodies with classification appropriate color, texture and relative radii. A star is any body which burns or once burned hydrogen fuel. The energy and light produced in stars comes from the fusion of hydrogen atoms. As stars grow older, they use up their supply of hydrogen and have to find other sources of energy. When they reach this point, they become either red giants or supergiants, depending on their size. As they continue to use up energy, stars eventually become either white dwarfs or, in the case of very massive stars, neutron stars or black holes. The star database in Starry Night is actually a compilation of several databases: the Hipparcos catalog, the Tycho-2 catalog, and Starry Night Pro and Pro Plus also include the USNO-A2 catalog. The Hipparcos catalog comes from a European Space Agency project to determine the distance to our nearest stars. The 100,000 or so stars in this catalog are correctly plotted in 3D space and accurately displayed in Starry Night. This means you can leave the Earth behind and visit any of these stars. When you get there, the star will be rendered as a 3D body with the correct colour, texture and relative radii. It is as close to being there, without actually being there. Stars can be classified based on their spectral characteristics. This is done by splitting light with a prism or diffraction grating into a spectrum of colors and absorption lines. Absorption lines (dark lines or lines of reduced intensity on a continuos spectrum) are used as ‘fingerprints’ to help identify the relative abundance of different ions, which vary with the temperature of a star’s photosphere. In short, the absorption lines present in a stars spectra allow us to classify stars into several spectral classes depending on the temperature of the star. And in general, a star’s temperature determines its color. The scheme we use is the Harvard Spectral Classification Scheme, originally developed in the late 1800’s at the Harvard college observatory. The scheme uses single letters of the alphabet to group stars according to their spectral features. Stars were assigned a spectral class letter based on the strength of the hydrogen absorption lines in their spectra. The main spectral classes are OBAFGKMLTY. This sequence is ordered from the hottest to the coolest stars. Using this scheme, our Sun, the nearest star to Earth, is a class G star. There are two main methods to describe the color of a star based on spectral class. In Starry Night 7, we use theconventional colour description in the table above to represent spectral class colors. The conventional color description is what would be seen if the star were put under high magnification and projected onto a white sheet of paper in the daylight (takes into account only the peak of the stellar spectrum). Using this color description, our Sun appears yellow. However, the actual apparent color description is what would be seen by the human eye under a dark sky. Using this color description, our Sun appears yellowish white. A future update to Starry Night, will allow you to select between conventional color and apparent color to represent the spectral class of a star. Each 3D rendered star displays a high resolution texture with detailed sunspots and granulated features, based on spectral class. We tried to make each star as unique as possible. All 3D stars in Starry Night 7 are rendered with their correct radii. To show the relative sizes of different stars, Starry Night places you at 0.023 Astronomical Units (AU) from a stars center when you select the Go There command. This means that a red giant star will appear large on your screen and a white dwarf star will look very small. Besides the star surface itself looking more like it is emitting light rather than reflecting light like a planet does, we render simple atmospheres around the star. Each star has a "lower" and "higher" atmosphere. The lower atmosphere typically extends no more than 0.1 radii from the star and gives a softer-looking edge. The higher atmosphere typically extends multiple radii away from the planet and provides the overall haze effect within the vicinity of the star. Based on the stellar class, we try to convey a sense of luminosity by varying the atmosphere sizes. In addition to orbiting a 3D star, you can also land on its surface via the Go There Surface command. Each star has a unique horizon panorama to match it’s spectral class. Software development sometimes entails hardware development too! There were (for us) many firsts with the release of Starry Night Pro Plus 7. Exoplanets, data streaming, in-application updates, automatic crash reports - to name just a few. The scope of these new facilities and modernization of the old ones required tons of development time on the app itself. In addition, a lot of development had to be done on our servers too, a topic of a future article. There is, however, one other area which has required many hours of development and use of a large number of technologies, most of them necessary to automate the process. This component is now integral to the lifecycle of SN7 and any future versions of our desktop applications. It assures that problems are caught early and that updates are tested before everyone gets them. I am talking about our Starry Night Beta program. Mentioning beta testing evokes notions of release candidates, fixed release schedules and long delays between changes in the beta code and their eventual release to the public. We, of course, do our best to adhere to the wisdom of desktop beta testing. However, we also wanted Starry Night Beta to be more agile, and, above all, always alive. Among other things, with the new automatic crash reporting and streamlined workflow of dealing with bug reports and user submitted support tickets, we wanted SN7 development to be as responsive to our users as we can make it. We scrutinize every crash report and investigate every bug report. We try and catch problems early. And we want to get relevant improvements and fixes into the software as soon as possible. This is what drove our implementation of in-app updates. And this is what drives our efforts in keeping Starry Night Beta going, even after SN7 has been released - because updates need testing too! There are many arms to the beta (sometimes also referred to as "nightly") builds of SN7 and the systems used to get changes as quickly as possible into the hands of our testers. Here they are in their raw, technical jargon. All of the following tasks are fully automated, set in a sequence, and alert the developers of any problems encountered along the way. Windows: create a new full build of Windows for local app archive. Use already built Sky Data from our constructed Mac app. Windows: build all delta updates using wyBuild. Let wyBuild upload all the data to our S3 server for distribution. Finally, on the distribution chain, we keep things separate between public releases and Starry Night Beta. Applications built for public release are essentially different builds (which is why beta versions and release versions will never again have the same build numbers). Beta builds only get beta updates. The same rule applies for public releases. On Mac, our appcast server reads different entries from our release database (to which information is added during the above build steps). On Windows we keep separate wyserver.wys and wyBuild projects - one for public releases and one for beta. And this is just the nightly automated script for a single application (Pro Plus 7)! There is still a lot to be done to improve this system, parallelize some processes and implement failover solutions for others. We are currently using Parallels VM in order to easily script everything directly from one source. However, a Parallels VM could be replaced with another EC2 (Windows) instance. We want to keep the nightly builds no matter what and to make them faster and more robust! Even beta needs testing and development (a beta for Starry Night Beta?). Until next time! Clear skies! Starry Night Pro Plus 6, when fully installed, occupied more than 10GBs of disk space. The sheer size of it required jumping through lots of technological hoops; from huge downloads to special DVDs, each with their own set of gotchas. This led to a lot of problems, all to deliver every last bit of data, much of which might never be accessed! With the ever expanding volumes of interesting astronomical data available to the general public, as well as the near ubiquitous availability of high-speed internet access, Starry Night 7 was designed with a new mantra... deliver it on-demand! Not wanting to sacrifice our tradition of beautifully simulating huge sets of astronomical data, we designed a new, robust system to stream the high-resolution, or rarely accessed data as its needed. Not only do we now have the ability to deliver you, our users, essentially infinite amounts of astronomical data, but we can now deliver you ONLY that data which you want. Zoom in on a particular piece of the sky, descend onto Mars, or choose one of dozens of available horizon panoramas and Starry Night checks your local hard disk for the necessary files. If they're found, they're loaded into the sky. If not, Starry Night makes a request to our servers to download the necessary data, streaming it to your computer where it will remain for the next time you need it. This was done in a very limited way in Starry Night 6... only very dim USNO stars were served up by this system. We have since expanded on that (and will continue to expand on that) to include the AllSkyImage layer and dozens of high-resolution planet surface textures. Horizon Panoramas are next to come along with individual object data, and more and deeper databases. Some 27 GBs of data rests on our servers, waiting to be streamed! Sit back, zoom in, and enjoy! Development of Starry Night 7 is proceeding quickly, so I thought I'd take a sec to update everyone on what we're working on. In the very short term, we'll release Starry Night 7.0.2, mostly to address crashes and other incompatibilities that weren't discovered during beta-testing. We're focusing on issues that make it difficult to use the app, and features that might be broken. I'm taking this week to true up the Equipment list too. In the weeks to come, we're going to take a solid look at all of the feature requests, suggestions and comments all of you have made, as well as usability issues discovered by our Beta-Testers. We'll be rewriting the Observation Logging feature, with a particular emphasis on sharing logs... with each other and with other applications. We'll be sure to enable importing of your V6 logs, not to worry! In addition to improving all of the obvious observing features, we'll be looking at other ways to share experiences with your friends and co-observers, improve add-to and refine our databases, and improve the speed of the application. Stick with us. Lots of interesting things to come. In Starry Night 7 all stars, such as Rigel shown here, are accurately rendered as 3-dimensional bodies with classification-appropriate color, texture and relative radii. You can even land on them! Starry Night 7 brings the Earth to life! with advanced planet rendering including terrain shadows, ocean floor shading, specular reflections on water (light reflected from lakes and rivers), and city lights visible on the night side. Because of the ubiquity of the internet, the vast volumes of data available to us (and therefore you, the SN user) and new security requirements imposed by operating systems, Starry Night 7 has introduced the idea of a "dynamic" (writeable) Sky Data folder. In previous versions of SN, the application itself would edit (write to) files in its own Sky Data folder located either in the application package (on OSX) or in the Program Files folder (Windows) and this is now considered very bad behavior. Note that this is where any "streamed" data will be located too. While we've made every effort to hide this ugliness from you the user, if for any reason you want to get your hands dirty and edit a file manually, it should first be copied to the same respective path (e.g. /Sky Data/Planet Images) in this new folder, then edited there. Any file located in this new Sky Data folder should have the effect of overridding the one in our static Sky Data folder. Now, for the part you've all been waiting for. How do you get all of your Equipment, Distance Spheres, Locations, Preferences, Custom (User) Planets etc. from SN6 to SN7? Simply copy the individual files from your old "Prefs" folders into the matching locations in the new "Starry Night Prefs" folder! As many of you have noticed, we're back with a brand new version of Starry Night! Rather than list all of the cool new features, I thought I'd take a moment to make clear our motivations for the changes in SN, our process getting to where we are now, and plans for the future. For many of our loyal, longstanding users, the new user interface is a big change from what they're used to. Our motivation for the change was simple: the interface had gotten to the point where users were spending more time looking at (or looking for!) controls, than looking at the sky. We needed something new, cleaner, less obtrusive. In our redesign, we followed the general philosophy that the UI should "be there when you need it, disappear when you don't." The focus should always be on the sky view, never the controls. This for example, is why we moved the Find pane from the left to the right... in general, people read left-to-right. Left is more prominent, so the sky view should always be at the left. Our move to a "Universal Search" function was similarly motivated. We found that over the years, so many of the great new features that we had added were buried under layers of user interface, that not only were they hard to use, but people often never found them in the first place. With the ability to do a textual search for control items (not just named objects in the night sky), we have opened up a host of existing features to users who didn't even know about them! No longer do you need to know exactly what setting you're looking for, open the Options panel, visually search for it, and click to make a change... simply search for the word (or even a related word) that you're looking for, and you'll probably find it. While I think we have succeeded in many, many ways, we still have much work to do. Going forward, we plan on continuing with the idea of "less is more." Not in terms of what you can do (indeed, we are addingfeatures and data) but in what ways you are distracted from what you are doing. Think: more of what you want, less of what you don't. While we have released it into the wild, we're far from done with it. Starry Night 7 should be thought of as a journey, not a destination. I'm a big fan of Massive Open Online Courses (MOOCs). I think they'll ultimately revolutionize the way that Universities operate, and they're certainly making them rethink things already. I've tried my hand at a few for fun, review and professional development (See: Khan Academy, Coursera and many more), but haven't tied any relating to astronomy. Have you? Have you found a good one? As a developer, I find myself with multiple applications, windows and tabs open on multiple monitors at any given moment. My workflow is that of a typical developer, I think, but probably not that of a typical Starry Night user. When working on, or simply using Starry Night, I often find myself wondering whether people make use of fullscreen mode, and whether we could provide them a better experience by improving it. It's not a (typical) productivity application, but neither does it demands the users constant focus, as a game would. With the emergence of tablets as the dominant (or at the very least, growth) platform, users might expect a more robust full-screen mode. How do you use Starry Night? Windowed? Fullscreen? If so, when and why?